Pursehouse Rural prioritizes building long-term, beneficial relationships with our customers and suppliers to assist in providing the highest possible levels of customer service. Celebrating over 50 years in business Pursehouse Rural has gained an insightful and extensive knowledge of local farming conditions enabling our employees to offer all-inclusive services for local farming communities. Dealing with a long established and well respected company like Pursehouse Rural, customers are left with no doubt that they are receiving the most accurate and up to date information to assist them in growing their farming enterprise. 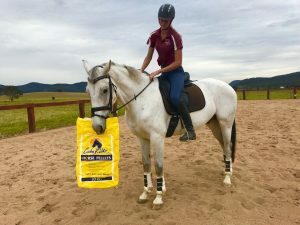 My name is Jess Somerfield; I am an equestrian rider and coach; specialising in dressage and eventing based in the Hunter Valley; my current top horse, a 6 year old warmblood, Lakeview Albion, has a funny stomach and is super reactive to many grains and other normal feeds, making him very spooky. I came into Pursehouse Rural, Muswellbrook to trial the new Calm Ride, and on the weekend, we competed at Sydney International Equestrian Centre, for one of his best performances – winning the 1* class after dressage (72%) and finishing 3rd overall against some fabulous competition. Albert was the most rideable he has ever been! I am such a convert to Calm Ride, thank you so much for your suggestion and I think all my horses and also my client horses will have to be on this feed from now onwards. I’ve found the team at Coolah go above and beyond providing service and an understanding of the farming industry. Services at Pursehouse are available with a minimum of waiting time, thus saving valuable man hours. Pursehouse have hosted several client information seminars in our area, something rarely provided by other companies. we have found the seminars informative and the knowledge learnt and shared has already had an effect on our management decision making. The teams’ attention to customer service is second to none and they are committed to providing creditable information and advice backed up by quality products and practical solutions. Pursehouse are good to deal with, service is excellent and delivery is prompt. Sound agronomy advice and prompt service both on and off farm gives me confidence when working with the team at Pursehouse, because I can rely on them. The Premium Ag services offered by Pursehouse keeps you up to date with information on trials conducted in the area, new product information and trials of these products. 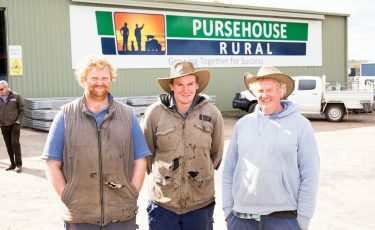 Pursehouse realise that farming requires partnerships to be formed with its farmers. Trust is a big part of this, working both ways. I trust their agronomists to give independent advice, both in crop and from their trials. Running a mixed farming enterprise is always busy. I depend on Pursehouse to take care of my spray operations to free me up to do other important jobs. We get good advice, prompt service and excellent product availability which are ensured by dealing with a long established and respected company that has had its roots firmly set in our region for 50 years. The staff are always there to help and willing to put themselves out. With the fertiliser, chemical and agronomy services, Pursehouse is a one stop shop.